So you have a Drupal site you installed a few years ago. You want to migrate data from that old installation. With some luck you were already at version 5.x. But with the current version being 7.x the upgrade path isn’t only rather long, it’s also very painful. In this article, I’ll be explaining how you can easily and flexibly migrate data from Drupal 5.x to Drupal 7.x. Now, before we start, let’s define the problem at hand. After that, we can explore the options you have for migrating. And finally, I’ll go into detail how to migrate using CSV and the Drupal 7 Feeds module. First off, let’s define what you want to do – or at least what I’ll help you to do. I’m not talking about full Drupal migrations offering all capabilities of Drupal 5 in Drupal 7. I’m talking about data migration, and not even all data. I’m only talking about specific Drupal 5 CCK data. Having custom fields and look-up fields is no problem. Migrating nodes from Drupal 5 with custom CCK content types and fields to Drupal 7 not using CCK but using the built-in Drupal 7 fields. This means you need to set up the content type on a working Drupal 7 installation before migrating. The content type definition is not updated for you. You may need to make some design decisions for Drupal 5 fields that are no longer supported in Drupal 7 (e.g. usernode references) or fields that didn’t exist yet in Drupal 5 (e.g. entity reference). Note that most migrations will not be one-on-one copies from Drupal 5 to 7. You will probably have (minor) field changes which make direct copies harder and need a transformation step. Read on, I’ve got you covered. So how does the migration I propose to you work? Simple but powerful. This works for sites running Drupal 5. It may work for higher versions as well. First, think about the data you want to export. Try visualizing this in your old site. And before you start making crazy queries, try thinking of the smallest content type you need to migrate. For example, you may link to locations (addresses) from different nodes. Locations also have route descriptions or something, but they are atomic – they link to no other entity. Now create a View of the data you want to export. That will be the data you export to CSV. To be able to export, you need to install the Views Bonus Pack module(s). After installation, enable the “Bonus: Views Export” module. This allows you to add additional parameters to views to export to CSV. Clicking this link will allow you to download the CSV file. It uses the display name of your selected fields to export the data. Make sure you set these correctly, or you’ll end up with too descriptive names that will make it harder to import later on. 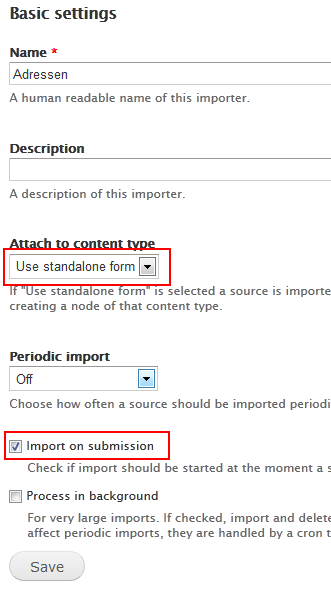 Attention: it may be a good idea to (re)format or (re)arrange your fields and their input already to make it easier to parse in the import step. For example, if you have node references, include them in your View (show the node’s title), so you don’t have to map them in your destination site. – Uniqueness: by default, I use the “Title” property of a node to determine uniqueness. This is a handy way of working if your nodes actually have unique titles. The import module will require one field to be unique, so if you don’t have a title, you can use the node ID as a field. – Node reference: it is perfectly possible to import nodes that have links to other nodes. The only thing you have to do is make sure the referenced nodes are included in your View as fields (either title which I use or node ID if you save the old node ID in your destination site). Install the Feeds module. It requires the Chaos Tools and Job Scheduler (even though you don’t need to schedule imports if you don’t want to). Next (in Drupal 7), go to Structure > Feeds Importers. Next, create a new importer or clone the default “Node import”. Then, make sure you select the “File upload” fetcher. You could also use the HTTP fetcher and link to your Views CSV link. Didn’t try that yet. Next, choose the CSV parser. The default delimiter “,” is ok, make sure you don’t check “No headers”. The defaults are fine. Use the “Node processor” processor. Here, select the target content type in the “Bundle” drop-down list. You can change the other settings if you like. In the Source column, select the name of the column as it is used in the CSV file. Then select the content type destination field in the Target column. The unique column is important to be able to figure out whether nodes with a title that matches a records in your CSV file already exists or not. You must have one field as unique for the record. Note the “Locatie” field. In my target site, this is an Entity reference field. Feeds knows how to work with this, but you need to provide a destination to link to in your CSV. In my case, I used the title of the Locatie node in my CSV directly. Feeds can find this node easily and links it during the import process. The Tamper module allows you to apply some extra filters per field. This allows us in this case to make sure dates are parsed correctly. Mapping directly didn’t work. A nice progress dialog is shown while your data is being fetched, parsed and processed. In this article, I’ve discussed how to export nodes with custom content types and fields to CSV and how to import it back into Drupal 7 with the Feeds module. If I am to ever migrate content again, this is the preferred way for me. The intermediate CSV step allows you to perform some extra modifications to the data (e.g. using regular expressions) that you would otherwise have to do in code. For the record: the larger batch I’ve imported was one with 5 field mappings for a total of 300 nodes. So no, I haven’t had performance issues. The 5×300 batch imported in less than 30 seconds on a shared hosting provider (dev site). I did have some issues with multivalued fields. 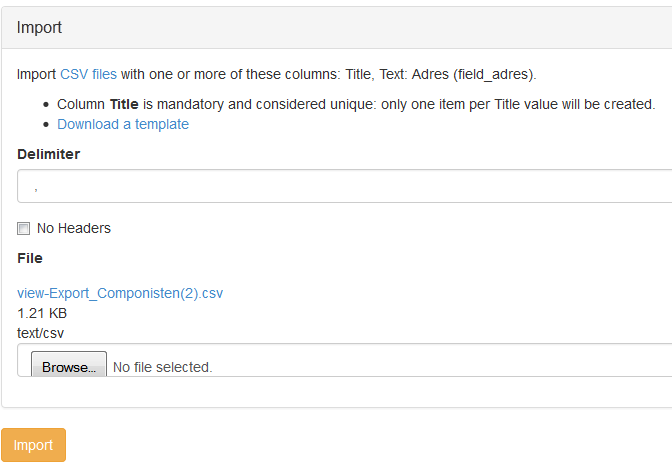 The Views on Drupal 5.x allows you to export this, but only allows the “Group multiple values” for a field. This just concatenates the multiple values together, but doesn’t separate it any way. Don’t know how to fix this, but with the limited amount of data, I could get around this.